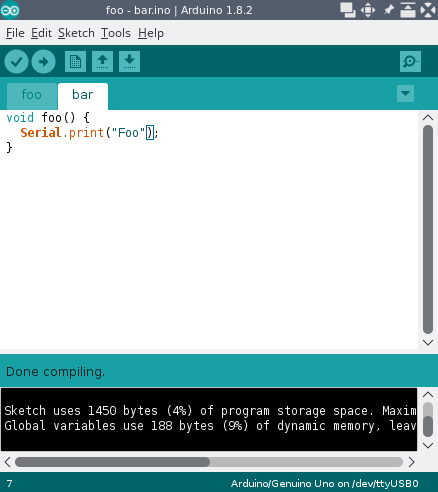 I'm trying to split up a large project of mine into separate tabs in the Arduino IDE and I'm having more than a few troubles with it. My main trouble is finding a way to have routines in extra tabs access the Serial object; because it's really hard to debug things with Serial.println() otherwise. All I get, though, is "'Serial' was not declared in this scope". There appears to be some kind of trick to this? I've noticed that "byte" or "bool" needs to be declared in .cpp tabs and .h tabs but not on the main one? Is there some kind of easy way to set this up so that I don't need to constantly #include <stdbool.h> and typedef unsigned char byte;? EDIT: Found a silly typo. Problem solved. return 0; //previously had no return although returning 'byte'. //All function prototypes from driver.cpp. Also corrected a typo from PrintMessge to PrintMessage. This is the "professional" way to do it, seperate implementation and header files. If it's named <something>.ino it will get merged with the main tab. It's just like working in one big file and you don't need to do anything special. If it's named <something>.cpp or <something>.c it's a completely separate translation unit and has to be manually "enroled" into the Arduino system by including the Arduino.h header. Not the answer you're looking for? Browse other questions tagged arduino-ide c++ c or ask your own question. 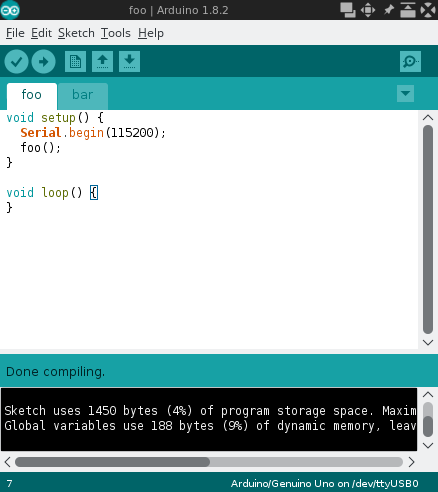 Is Arduino IDE enough to program with C or C++?